Thread: Help me front Suspension Guru's! My 04 Super T is making a "clunk" noise whenever you hit an obstacle (rock, log). It's very noticeable when you pick the front wheel up and drop it down. I think I have narrowed it down to the top cap on the rebound leg. 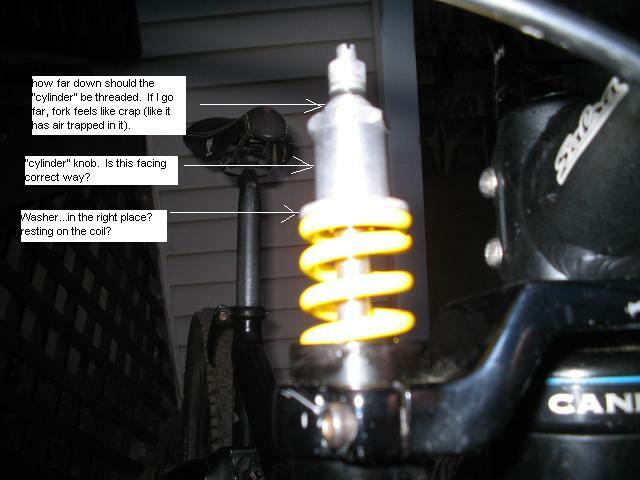 Can someone look at the photo and see if my LBS put the parts back correctly (top of the coil spring)? I want to start there first. Not shown in the photo is the top cap itself, "C" clip, and black compression adjuster knob that sits on top. P.S. I had this problem with the original Sherman years ago. I believe switching to the Super T with the 1.5 reducer stopped the noise (for about a year). Is it possible that the reducer is wearing out and allowing the fork to move back and forth? Do you feel any slop or play at the headset when the fork is all put together. Just give the fork some little wiggles and see if you can feel, see, or hear any slop comming from the headset area. headset does come loose a little from time to time. I'm thinking the reducer may have something to do with this. It's weird, when I ran the integrated stem, it was fine. I put this new cheap Stem on, and it's acting up. I'm going to put my old stem back on today to see if it still happens. Any comments on the questions in the photo? Ya those parts look right.When you screw down the preload that piece screws down on the spring. One side of the white washer is flat and other has place for top silver piece to sit in.I don't think that fork had comp damping knob. The black dial is preload on the spring.When you screw on top cap it engages the cylinder and turns it but after top cap is tight you can back off the preload again with the black dial. Could the noise be the springs buckling, flexing sideways and banging the against the insides off the stanchion tubes? iF so maybe try adding a little preload to hold the springs or cover the middle section of the springs in PVC Heat shrink tubing from MCMasterCarr.com 1" diameter. Or could it be the c-clip worn and not holding the cartridge tight enough, I recall some people having this problem with certain Marzocchis.They added a thin shim under the c-clip. Marzocchi may even have this shim now. Not sure which model fork this occurs. Search? Older Marzocchi forks develop a clearance issue between the cartridge and the top cap resulting in the play / noise you have described. Marzocchi sells shims that you place under the top cap cir-clip to eliminate the play. You could take it a setp further and replace the threaded peice on top of the cartridge but the shims seem do the trick. I think the design is sort of flawed - all that top out load on that threaded aluminum and cir-clip. If it is really bad you can push down on the preload knobs and feel the play. Same design on(in) most motorcycle forks regardless of maker for 20+ years, I somehow dont think its flawed. Clearance issue? The cartridges are in the bottom of the leg with the rod extending all the way up, spring and hardware conrtained - the only reason it should be making noise is if the cartridge is damaged or has loosened up from the bottom of the leg (Tightened by bolts/allens on bottom of legs) but that is very uncommon. Just to update...I already have the washer provided by Marzocchi. It still makes the noise with it installed. One thing I DO notice is the "rod" has play inside of the fork leg. It moves back and forth and sometimes doesn't sit centered on the washer. Maybe I need a new washer!? This is the rebound side of the 04 Super (not the dummy side SSV). Just tookall coils out from the top of both sides. I mean, you can touch it and it hits the inside wall of the stanchions. 2, After taking the bottom coil out on the rebound side, I noticed what appeared to be a "star shaped washer" that was attached to the rod, this washer thing was loose and spun freely. What is this for? It seems it was just there to hold the lower coil in place.